By TruePublica: The message is clear about climate change. Or at least it should be. 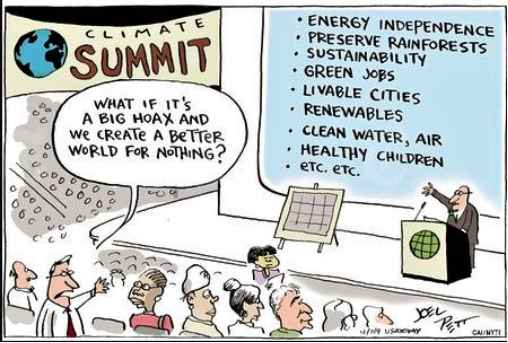 But if somehow you still do not believe that climate change is happening and that it is all a hoax then look at the cartoon and absorb the message. In other words, even if climate change was not a thing, why would not want energy independence, breathable air and clean water? There is no logical answer that can be given to counter the strong need to quickly change direction. And in Britain that change of direction would provide numerous much-needed jobs in a post-Brexit world. Air pollution alone is killing more people every year than smoking, according to recent research that called for urgent action to stop burning fossil fuels. In Europe alone, a region not as well known for air pollution as say India or China, researchers found it caused an estimated 790,000 deaths each and every year, where between 40 and 80 per cent were from cardiovascular diseases such as heart attacks and stroke. The problem here is simple – it’s not like you have a choice of which air you breathe. For instance, you are forced into breathing the lies of the car manufactures diesel fumes. Climate science denial is big business involving hundreds of millions of dollars. DeSmogUK reported recently about how fossil fuel companies have a long history of adopting public relations strategies straight from the tobacco industry’s playbook. New analysis shows the two industries’ relationship goes much deeper — right down to funding the same organisations to do their dirty work. So don’t believe a word about what the climate science denial mobsters and lobbyists are saying – they are lying. It’s propaganda and disinformation.